Cadence athlete, 2006 Canadian National Champion, and rider for Toyota-United Professional Cycling Team Dominique Rollin took a decisive victory in yesterday's stage four of the Amgen Tour of California. After the win Rollin's coach Brian Walton said, "I've been saying all year that Dom was 'locked and loaded.' He worked hard this fall and early winter and it's paid off with two early season victories--in Mexico and here in Californiaand three top ten finishes at the Amgen Tour of California. This proves that with the right training the domestic teams can fight it out with the world's best and come out on top!" Brian reported from California where Cadence is currently conducting a climbing camp in Agoura Hills, CA. On Stage Four, deemed the Queen Stage of the Tour of California, California's typically placid coastal weather turned ugly making the brutal stage a seven hour slug fest where a number of top riders abandoned or fell by the wayside. But not Dominique "the Horse from the North" Rollin. In a performance befitting his phenomenal natural talent and outrageous power output, Dom showed the world and the European peloton what he's made of. Not only did Dom win the stage, he also took every intermediate sprint to put him in the overall points leader jersey. 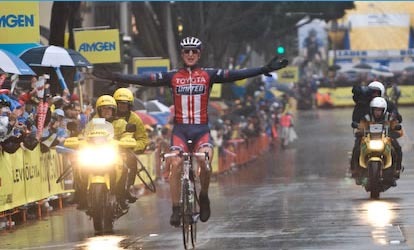 For more details, see the Amgen Tour of California website: www.amgentourofcalifornia.